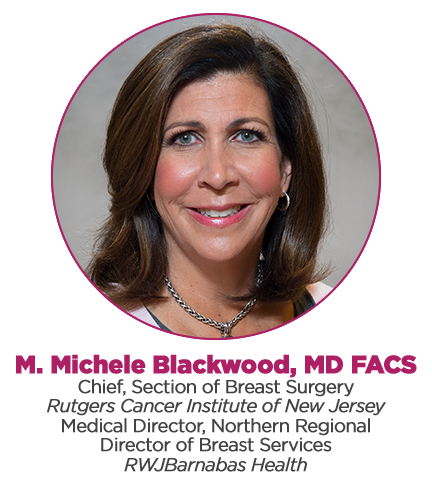 Michele Blackwood, MD FACS was recently appointed to Chief, Section of Breast Surgery at Rutgers Cancer Institute of New Jersey and as Associate Professor of Surgery at Rutgers Robert Wood Johnson Medical School. In addition, she serves as Medical Director at The Center for Breast Health and Disease Management at the Barnabas Health Ambulatory Care Center. As Northern Regional Director for RWJBH, Dr. Blackwood oversees breast cancer surgical and clinical services, programs and initiatives at Saint Barnabas Medical Center (SBMC), Clara Maass Medical Center (CMMC), Jersey City Medical Center (JCMC) and Newark Beth Israel (NBI). She is also taken on a system-wide role unifying the entire Breast Surgical division. A dedicated breast surgeon, Dr. Blackwood obtained her bachelor’s degree from Georgetown University and graduated with her medical degree from the Medical University of South Carolina. She completed her internship and residency at The Stamford Hospital, and fellowship with the Breast Service at Memorial Sloan Kettering Cancer Center, New York, NY. She is a Fellow of the American College of Surgeons and is certified by the American Board of Surgery. In addition, her various academic appointments include Clinical instructor, New York Medical College and Assistant Clinical Professor, Department of Surgery, Columbia University. Dr. Blackwood has published several articles in professional publications, including The Lancet and The Journal of Trauma, and served on the Editorial Review Board for Women in Medicine Journal. She is a frequent guest on national and local media programs including Fox Five Television, WOR Radio, “60 Minutes,” The Montel Williams Show, CBS News, Good Day New York, More Magazine and CBS’ Early Show, among others. Dr. Blackwood is affiliated with Saint Barnabas Medical Center, Ambulatory Care Center, and Robert Wood Johnson Hospital CINJ.